baby Ridley bump. 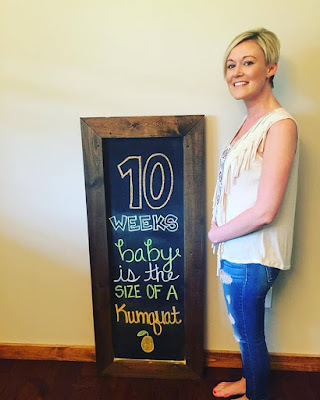 : 10 Weeks! Total weight gain? I was supposed to have my first sono tomorrow with my local doctor, but the doctor reviewed my ultrasounds from my RE and decided that I don't need one at this time. I go in on the 26th to meet with the nurse & do an intake, but I won't have a sonogram until 22 weeks!! That means our last ultrasound at our RE on Monday will be the last time I will see our babe for 11 weeks! That just seems cruel! Sleep? Sleep is about the same as last week, I have good nights and bad nights. Best Moment this Week? Well tomorrow's appointment was supposed to be my best moment, but since that was cancelled, I really don't have a best moment this week. Its been quiet and uneventful which is OK by me. I did stay home sick the first time this pregnancy with a headache on Tuesday. I also decided to somewhat start a registry which has been fun. One good thing about TTC'ing for 5 years was researching and learning about baby products, I could seriously have everything I wanted picked out now if I really wanted to. Miss Anything? I ended up having a grilled hot dog at a cook out (everything in moderation!) and it was worth it. I also had about half a Cherry Pepsi the other day when I had a headache that I could not get rid of. I will start caffeine again once I hit the second trimester. Food Cravings? Anything with carbs! Anything make you queasy or sick? Nothing! I've been so blessed to not have any sickness or queasiness at all! Have you started to show? Still just that food baby I've been carrying around. Happy or moody? Still pretty moody most days. Looking forward to? Our 3D ultrasound was also changed. They decided that they wanted me past 11 weeks so I go Monday the 15th, I will be 11w2d and we should be able to get a clearer picture. This is also when we do the NxGen test meaning that we will know the gender oh-so soon!! Doesn't it feel like torture having to wait so long between ultrasounds?! Especially b/c my first two (at 12 weeks and 2 days and 13 weeks and 2 days) were scheduled a week apart since one was my dating scan and the other was with the specialist since I have a high risk pregnancy. I go back to the specialist for my next ultrasound on Monday the 15th too when I'll be 20 weeks and 2 days! I definitely recommend Baby List for your registry. You can add anything from any site (even sites that don't have registries or sites that you can only get the product on that specific site). Oh yea and the headaches seem to get worse in the 2nd trimester, or at least that's what I'm going through right now. Lots of headaches and migraines and maybe some allergies or sinus headaches going on. Tylenol and caffeine rarely provide me any relief :(. Can't wait for your gender reveal!!! It's so hard to go from having weekly ultrasounds to basically none, except for the anatomy scan. It is reassuring to hear the heartbeat at every appointment though and once you start feeling the baby all the time it's even more comforting :) This is so exciting!! Not sure if there is a Babys R Us near you but you can get 10% back off of all purchases made from your registry (you can even buy them just check out as a guest to get the credit). We ended up getting a few hundred dollars in Babys R Us Credit after he was born. You are spot on with the whole "knowing exactly what is needed for a registry" thing...I think I started doing all of that way back in 2012!! Keep the bumpdates coming! You look FABULOUS! Oh those pesky headaches. My doctor said if I use to drink coffee and stopped its because of caffeine withdrawals. I'm sure once you start drinking it during the second trimester they will hopefully go away. Amazing that you know what baby products you want. I had no idea when I was pregnant with my son that my mom had to take me and give me the ins and outs of what was needed. Ha! I'm so excited to find out what you are having. Come on Labor Day weekend!! I'm jealous you aren't sick at all! (Not that I'm wishing sickness on you :)) I didn't get the headaches, but I know of others who've had them in pregnancy and they aren't fun. Isn't it hard to wait on US? It feels like a lifetime. But you look great!! happy 10 weeks!!! and i totally think sonograms should occur more frequently. its so amazing to see the little babe growing!